Over the course of the past year, the introduction of direct messaging on Instagram has opened up a super quick, direct line of communication with my followers. (That sounds so cultish and slightly pretentious, doesn’t it? My follllowers…#eyeroll #youknowwhatimean) ANYWAY, I try to get back to as many people as possible, but sometimes I notice the same question pops up again and again. The following is an iteration of one of those questions. Hey Sarah! I’m 41 and my skin is super dry right now…pretty red and irritated around my nose and mouth area as well. Any products you would recommend to get that situation under control? It seems this is a very popular inquiry and since old man winter is approaching, I thought it apropos to address this question on the blog. When people ask about this particular issue and they are otherwise pleased with their skincare products, I’m hesitant to change multiple things up. I think many times, a major change in skincare can aggravate dry and sensitive skin. The last thing you want to do is surprise your skin with a whole bunch of new ingredients, right? 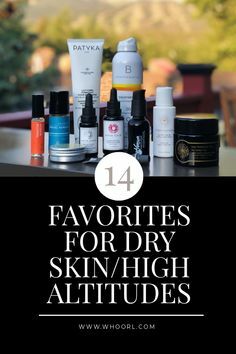 So, what do I suggest for super dry and irritated skin? Sing it with me. Balm balm balm balm BALLLLLLLMS. Yep, balms. Balms are super moisturizing, and more intense than a traditional lotion or cream. Most people use balms for specific dry areas, such as dry patches on the face, elbows, cuticles, etc. (Although in the driest months, you can apply a balm to your face as your last step in your routine to lock in moisture.) This is something that you can add to your routine during times of stressball skin behavior. With balms, a little goes a long way – I’m talking a teeny tiny pea-size is usually all I need. My favorites? LEAHLANI Bless Balm, Maya Chia Waterless Wonder Balm, and the new Kari Gran Essential Balm is rapidly climbing my list. 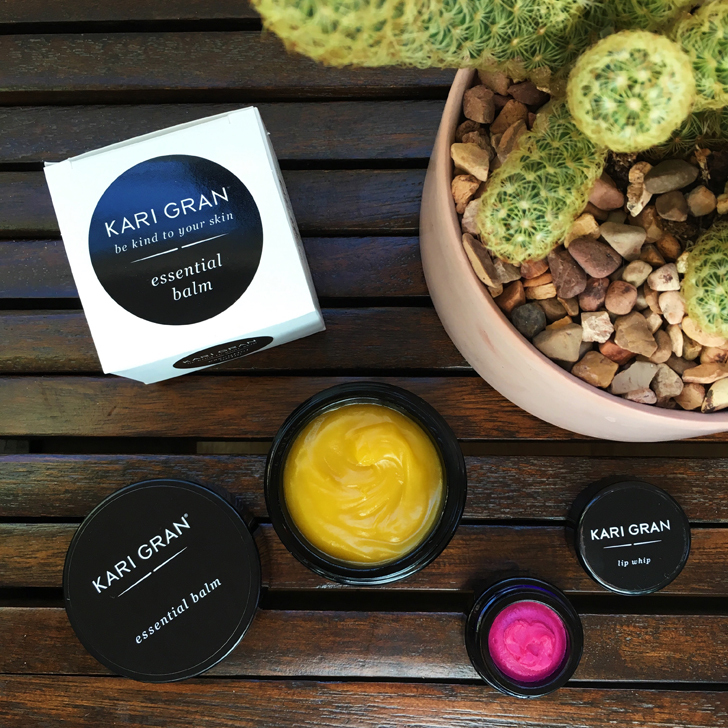 First, I want to start off with the Kari Gran Essential Balm because it’s currently part of the Beauty Heroes Limited Edition Holiday Discovery, and you can practically steal it this month. 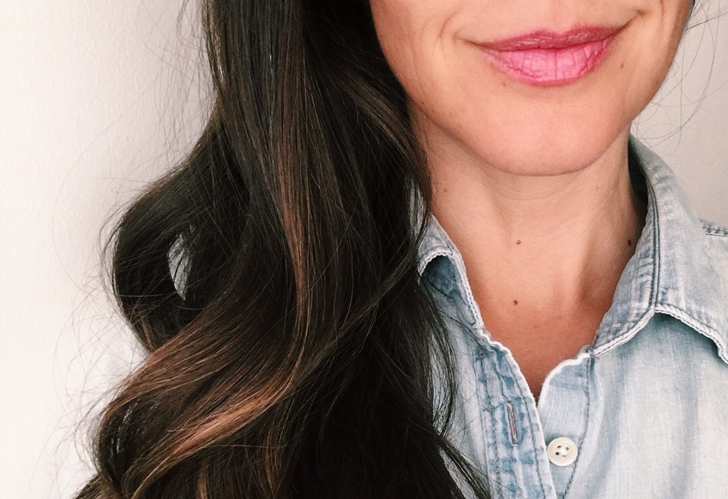 Kari Gran’s Essential Balm keeps things simple by doing more with less. 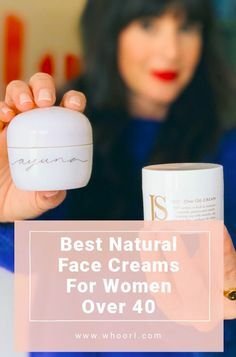 Part face balm, part eye cream, part primer, the ingredient list for this formula is totally legit, featuring organic green tea seed, avocado, rosehip, calendula, and jasmine. Unlike a traditional melt-and-pour balm, this daily essential has a butter-cream texture and loads of slip, meaning a little goes a long way. I really enjoy the texture and scent of this balm – like I mentioned, it isn’t hard or waxy that melts with the warmth of skin. It’s the coolest soft texture, like buttercream or pudding. You just need to tiniest amount to hydrate the skin. Scent-wise, I pick up ylang-ylang, jasmine, and frankincense. It is truly lovely. This year’s Holiday Discovery includes a full-size Kari Gran Essential Balm ($95) and your choice of Tinted Lip Whip ($21), which is a total value of $116, but the discovery price is $55. How incredible is that? Plus, what’s extra special about this discovery is that $2 from the sale of each box will be donated to The Malala Fund, to support a complete education for girls around the world. As for the Colored Lip Whip, it’s a hybrid of balm and lipstick, delivered in bright pigments. However, these shades aren’t crazy bright and opaque – the apply very sheerly. (For instance, I chose the shade Jolene, which is pictured above, but it’s just the slightest wash of fuschia pink on my lips as you can see below. Totally wearable on any occasion. I also own Suji Red, which is a great neutral red. Perfect for the holidays. You can choose between Jolene, Suji Red, and Jeannie. You can read about the lip colors, as well as the balm here. I would jump on this offer because it will surely sell out. However, I have a couple more balms that I use in heavy rotation when I need a little more hydration. Bless Balm by Leahlani and the Waterless Wonder Balm by Maya Chia. Obviously, all of these balms are going to serve you well in terms of hydration and calming the skin, so I really think the difference is in the scent profile. As I mentioned above, the Kari Gran balm is a mixture of frankincense, ylang-ylang, jasmine, and some lavender. It’s the headiest of the three scent profiles, and definitely feels like a luxury ritual when I apply it. I am definitely more apt to use this balm on my decolletage and neck. However, for my face, on the rare occasion when it’s acting like a surly teen, I look for minimal scent profiles. My facial skin likes fresh, subdued scents, especially when it’s super dry and sensitive. My go-to? The Maya Chia Waterless Wonder Balm, $42. 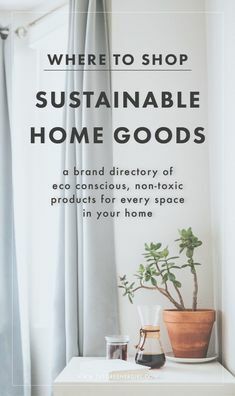 (Yet another product by Maya Chia! I can’t get enough of this line.) It barely has a scent at all. It is so delicate, with the main scent being orange blossom. (Which I love.) It’s funny because it’s touted more as a body balm, but I definitely use it sparingly on my face for dry spots or sensitive, angry areas. I really like this one, and I use it on my kids as well. If you are sensitive to scent, this one’s for you. Finally, it’s hard for me to stop sniffing myself when I put on the LEAHLANI Bless Balm, $48. Orange blossom and blue tansy – oh my goodness, what an amazing scent. This balm is a lovely pale shade of pink, smells uplifting and fresh, and my skin loves it. This balm is especially beneficial for dry, sensitive, and mature skin. I truly believe everyone should have at least one of these balms in their arsenal. Hit me up with any questions you have in the comments! Can you recommend something for super dry hands? I use the Maya Chia on my hands. Would these balms also be good for dry/combination skin? For some reason certain oils and balms really break me out.